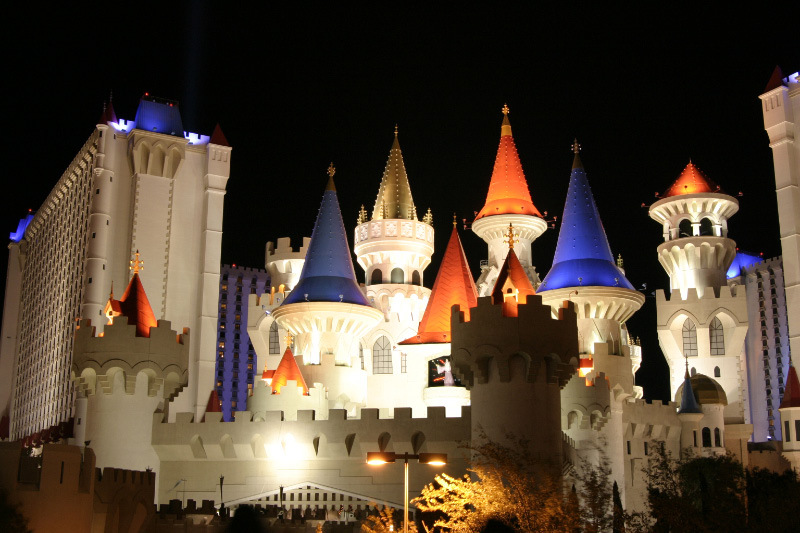 Excalibur Hotel and Casino in Las Vegas Nevada is one of the first mega hotels built in Las Vegas.This hotel opened with a 400+ rooms, making it the largest hotel, at its opening, on the strip. The exterior of the property it is colorful, playful and stands out as a more family style hotel. I was not impressed when entering the lobby. It was dark, dank and did not smell fresh. The carpet in the lobby showed the obvious signs of wear and it’s time for to be replaced. We’re mostly casinos in the Las Vegas market have a grand backdrops behind their front desk area this hotel offers nothing pleasant to look at or experience and check in. As I entered it the hotel I was accosted buy individuals attempting to have me and my family signed up for a timeshare tour I am in a hotel year and found no interest in this but the sales person continued to insist Time and time again that’s all I needed to do was to spend three hours tomorrow looking at what they had to offer, what a waste of my time and an annoying way to start this experience. The guest service agent who checked us in was both competent and pleasant. Although like most hotels in Las Vegas the trip to your room required us to walk through the gaming area, then up in the elevator but then I was pleasantly surprised when the hotel on my request to have a room close to the elevator. Given the price that we have paid ($79) I was not expecting much but once again I was pleasantly surprised. The room was spotless, well-maintained and offered typical hotel amenities. The carpet in the room was new / fresh and the mattresses we’re comfortable. The standing show at this hotel is a mid-evil show compleat with jousting, kings, knights, horses and of course porridge and turkey leg. If you have children along for the ride it’s well worth the cost of admission. Overall this hotel does a good job and offers a true value in a city where excess is king. If you’re on a budget perhaps just a quick weekend getaway this is a great place to drop your suitcase and the experience all that Vegas has to offer.